Automatically downloads torrents of your favorite shows. Is there a better alternative to TVShows? Is TVShows really the best app in Video category? 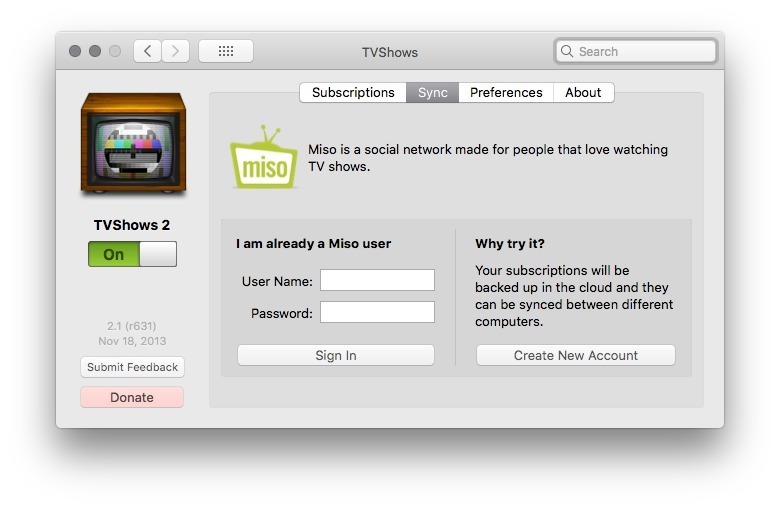 Will TVShows work good on macOS 10.13.4? 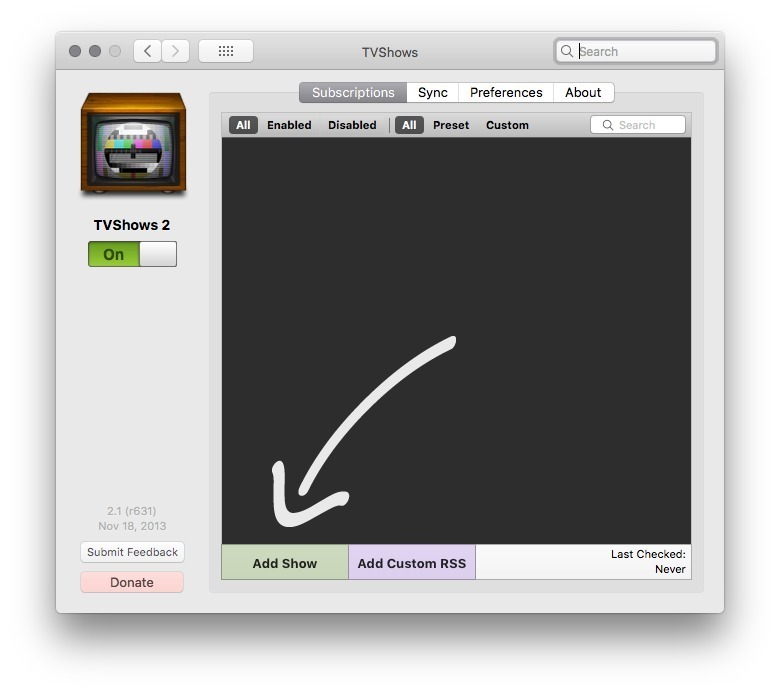 TVShows is a Mac OS X application that automatically downloads torrents of your favorite shows. You no longer need to manually download torrent files, or find a working RSS feed for each show you wish to subscribe to. TVShows does that for you. Simply select your subscriptions and set your preferences from within the TVShows application and we'll take care of the rest. TVShows uses a lightweight background process which automatically launches at a regular interval (chosen by you) to check for new episodes. Added full support for OS X 10.9 Mavericks. Added Hungarian, Western Frisian and updated translations, many thanks to our translators. If you want the app in Frisian, check out the blog. Added Retina icon for the menu bar (sorry for my poor design skills). 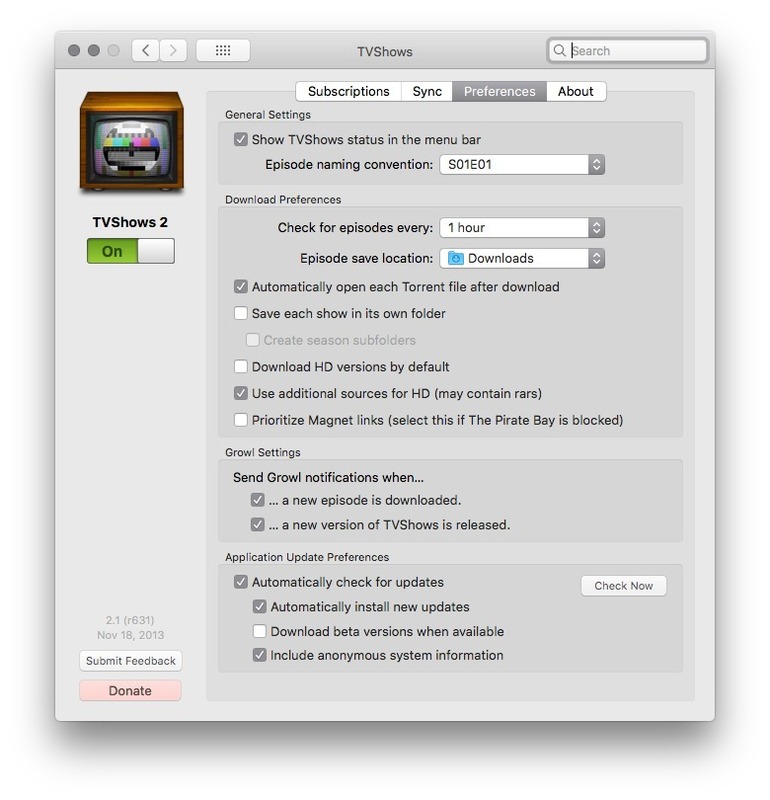 Fixed crash when looking for episodes in OS X 10.9 Mavericks. Quality Selection: Choose your preferred quality settings (Normal or HD) and TVShows will download the closest one available. E.g., if a show is not available in HD in the next three days of emission, then the normal version is downloaded. Show List: Stop hunting for individual, working torrents and RSS feeds. TVShows does all the hard work for you. Just search for the show then click Subscribe. TVShows is developed and maintained by Víctor Pimentel with the help of countless beta testers and contributors. Fixed crash when adding shows. Fixed cancelled ribbon in modern systems.